Edmond Caldwell on Contra James Wood has a piece on The Millions' new Top 20 list for the new millennium. I think EC has slightly missed the problem. I got an email a while back from The Millions asking me to nominate my top 5 books for the new millennium, with the following constraints: they must be fiction, they must be available in English. The idea was, The Millions would then tabulate all votes and come up with a top 20. So. If some of the most interesting writing I've read has been in a blog, or a pdf, or a webcomic, or just in emails, I can't mention it - it has to be writing that been legitimised by a book deal. Also, if I've read someone brilliant in a language other than English - someone who hasn't happened to sell English-language rights - I can't mention that either. So I can't use this to give interesting writers a better chance of attracting notice and getting an English-language book deal, I just have to endorse the status quo. Well, let's say I play the game and I just pick 5 novels published in English since 2000; I might still think this was a chance to draw attention to undeservedly neglected writers. Fact is, it can't work that way. The only writers who stand any chance of making it into the top 20 are going to be writers a significant number of other contributors have also noticed - which means they are wildly unlikely to come from the undeservedly neglected. They will come from the pool of writers who got promoted, who won acclaim, in other words from the much smaller pool of writers many of us have happened to hear of. On these terms, the only book I can think of that stands a chance of making the cut is Peter Carey's True History of the Kelly Gang - which, as it happens, didn't get onto the list. Possibly because it never did get my vote, because I thought this was silly. 2. A list of ALL nominations, with the names of the people who put them forward. We might expect, after all, that writers would read more widely than the general public; we might expect the most interesting contributions to be, precisely, all the nominations that only a handful put forward. The amount of weight we gave to such nominations would, unsurprisingly, be governed by what we thought of the individuals who made them. Freitakt #5 ::: i + e _ v e r n i s s a g e ::: john chris jones on Friday, October 2 at 8:00pm. "Take a Penny, Leave a Penny." book like nothing you've ever seen. to encounter and enjoy for the duration of the show. break the habits of a lifetime and be a devil. ...of course if you do not want to use a video projector i can just as easily read from the printed book without electronics! Cory, who is hosting the installation, told me his space was across the street from St George's (which is at Worther Strasse 27). It would be better to post with more accurate information, but I'm somewhat exhausted. Still, if anyone would like to participate in the reading of an animal reading path, drop me a line and I will pass it on. Go on, be a devil. Nothing remarkably incisive to say about all of this beyond the capsule rendition of how it works. It is an engine of professionalization, though. American job candidates, almost all of them, spend an entire year focused almost exclusively on this sort of thing – well, save for any teaching they might be doing, and frantic nighttime dissertation finishing. You enter into your first year on the market a kid who likes to read and write; you exit a fully fledged professional academic. Don’t get me wrong – there are good and bad things both about this sort of professionalization. But it is something to note, and perhaps something worth thinking and writing about a bit more, what effect the rhythm of the market has on intellectual life in the academy. Of course it’s always present, informing the decisions that people make about their work etc. But it becomes profoundly present, definitive, in bursts. There the struggle to get into a PhD program, and then relative calm for a few years. Then a frantic burst of market-awareness, then a bit of calm (at least on that front) as you start your job. Then the tenuring process, and after that, if you’ve made it, calm again… until you decide to look for another job… Goes on and on. Ads Without Products on the MLA job list. ...there is now a first generation of cheery looking robots intended to interact with autistic children, and save on the inevitable burn-out of many teachers. Terrific interview of Peter Carey about his new novel, Parrot and Olivier, at Granta. coursework essays, written as part of AS or A-level requirements. people say about modern grade inflation. stick with it. If you get distracted, you start forgetting. course at the end of a term or a year, not on the number who started. Characters wander around aimlessly, do things for no reason, vanish, reappear, get arrested for unnamed crimes, and make wild, life-altering decisions for no reason. Half a paragraph is devoted to describing the smell and texture of a piece of food, but the climactic central event of the film is glossed over in a sentence. The death of the hero is not even mentioned. One sentence describes a scene he's in, the next describes people showing up at his funeral. Josh Olson, however, was unimpressed. I was having a look at the admissions criteria for undergraduate degrees at the Oriental Institute in Oxford. Each year Britain goes through a crisis of conscience because about 50% of undergraduate admissions are students from fee-paying schools, who represent some 5% of the student population; I wondered what the requirements were for degrees which can assume virtually no relevant work at secondary level. My vague assumption was that they would be looking for students with strong evidence of linguistic aptitude - in other words, it would be the elimination of the language requirement at GCSE, with consequent fewer numbers taking a language A-level in state schools, which would be the biggest obstacle for candidates from the state sector. This seems not to be the case. All undergraduate degrees in Oriental Studies involve the teaching of difficult languages from scratch, since only in exceptional cases will students have studied the languages before coming to Oxford. Our experience has been that an A level in an Oriental language does not give significant advantage to a student, since the Oxford courses involve such a broad range of cultural elements in addition to language study. The progress of language learning from the start of the B.A. course is so intensive that the majority of students beginning from scratch find that they quickly catch up with those who may have some knowledge of the languages from school or family background. In other words, you might think, this could be a good choice for a student from the state sector, because the Oriental Institute has had to assume responsibility for teaching all students to a high standard from scratch. Students are offered a linguistic aptitude test which you can try out here (solutions here); the test seems to be designed to test whether you can get the hang of an inflected language in which word order is no guide to sense, a challenge for which five years of French, say, would offer no great advantage. Oddly enough, though, the things that really count seem much harder for someone from a school for students of widely varying abilities to demonstrate. We judge whether you should be offered a place to study an Oriental subject at Oxford according to the evidence presented to us in your admissions documents: your UCAS form and the written work which you submit, plus our assessment of your potential during your interview. (Some subjects may also set an informal test during the interview.) We would expect successful candidates to demonstrate the following: high academic achievement, great potential for the intended course of study, good work habits, international outlook and strong motivation. Oriental Studies courses require a) a capacity for hard and well-organised work; b) the motivation to tackle languages which in most cases will be radically different from languages learnt previously and c) skills of analysis, argument and description for essay writing on an unfamiliar culture. When I say it's hard for someone from a school with a population of widely varying abilities to demonstrate these qualities, I'm looking back to the schools I went to along the way; in this sort of school, if you hand in a piece of written work that is coherent, correctly spelled and grammatical, you will get an A. Teachers are not going to give challenging assignments, because they don't want weaker members of the class to be demoralised. They are not going to hound the A student for inadequate skills of analysis, argument and description. And they're unlikely to set large numbers of written assignments in any case - the kind of thing that would require a good student to develop excellent work habits - both because, again, they don't want weaker students to be demoralised, and because it's hard work labouring through large numbers of papers that are incoherent, poorly spelled and ungrammatical. A student in this kind of environment who has high academic potential is not necessarily going to have much in the way of a track record of achievement; he or she is likelier to do what I did, hand in schoolwork as required, be very bored, spend a lot of time reading. Such a student would be doing well to achieve the necessary A grades at A-level; I don't know that he or she would be likely to offer anything very impressive as supplementary material for an application. Went to a meeting / dinner at Golden Parachutes, a gallery in Kreuzberg run by Jesi Khadivi and Paul Tyree-Francis. Paul and Jesi are planning to open the space to anyone who is interested in offering a course, seminar or other event; the idea was to talk about some possibilities. This coincided, as it happens, with Obama's speech on education and also with a piece in the Guardian on the severe decline in British universities of degrees in modern languages, following the removal of the language requirement at GCSE. I write in that context. One of my ideas is to offer a two-hour (well, maybe three) class called Mute Inglorious Nabokovs. Nabokov was taught English and French from an early age; this early exposure to languages other than his mother tongue seems to have been important in his formation as a writer. In Speak, Memory he talks about the entertainment offered by working through a little grammar book, in which the student started on simple sentences, could look forward to ever more exciting grammatical features, and at the end was able to read a simple story. He remembers sitting inside while a servant swept the gravel walk outside; he wonders whether she might not have been happier sweeping the walk than driving a tractor in later years under the Soviets. This passage always makes me think: But perhaps she was a mute inglorious Nabokov. Perhaps the servant, too, had gifts which would have benefited from reading an introduction to English culminating in an adventure for little Ned. One thing that's certain, anyway, is that most schoolchildren do not get this kind of chance at an early age. More generally, it seems to me, there is never a point at which people are encouraged to try a range of languages, and in particular to see what it is like to read a short passage in each by a great writer. It seemed to me that one could try something like this: introduce three languages of increasing difficulty,* beginning with the simple challenges presented by reading, then working through a short text. 1. Italian. (A good starting point for the many people whose first second language was Spanish or French.) One introduces the principles of Italian orthography, so that the reader, looking at a text, knows how it shd be pronounced; one then goes through a short passage from Calvino's Invisible Cities, providing relevant grammar and vocabulary. 2. Ancient Greek. Alphabet not dissimilar to ours; the student still starts with a big advantage. The object is to work through the first 7 lines of the Iliad. One points out that the Greek alphabet can be divided into true friends, false friends and aliens. There are letters that look familiar and do, in fact, represent roughly the sounds represented by their modern lookalikes (α β δ ε ι κ ο τ υ ς Α Β Ε Ι Κ Μ Ν Ο Τ Ζ); letters that look familiar but represent different sounds (γ η ν ρ χ ω Η Ρ Χ Υ); exciting letters no longer in use outside mathematics (ζ θ λ μ π σ φ ψ ξ Γ Δ Θ Λ Π Ξ Φ Ψ Ω). One starts the student off with exercises spelling English words in Greek letters, moves on to introduce Greek pronunciation and some Greek words, and then goes through the first 7 lines of the Iliad. 3. Arabic. Totally different script, with many letters representing sounds not found in English. Also, a Semitic language! (How lovely!) But this, too, is less difficult than it looks; one starts on the script, using a version of the method described above, introduces the new sounds, and then works through a short passage - I was thinking, maybe, a few lines from Ibn Rushd on tragedy. On reflection 2 hours seems wildly optimistic and even 3 somewhat optimistic. Seems as though explaining how a Semitic language works would not be the work of a couple of minutes. Luckily, though, I can now use Jesi as a guinea pig and try to achieve a more realistic sense of how it is all to be done. Once the materials have been properly worked out they can be posted online and also, I suppose, published in book form (though it wd need an accompanying CD). Just the sort of book one wants on a long flight. The sort of book one could give to a child who has been dragged to the beach on vacation because younger siblings are not too old for the beach. * I'm thinking primarily, obviously, of anglophone readers, also German readers since we are sending up a trial balloon in Berlin. PS Hello visitors from Guardian Books Blog! If you'd like to be sent pages from the beta release as they're developed, do drop me a line! You have here a simple question that anyone can access. Doesn't matter that you've never run a linear regression in your life. If you've ever shopped for groceries, if you've ever stood in line with a candy bar, a soda bottle, and a matinee starting across town in ten minutes, you have an opinion here. Courtesy MR, Dan Meyer's post on queuing speeds in grocery stores. Just got this newsletter from Camfed. Can a book change lives? We believe this one can. Drawing on years of rich and varied reporting experience in Asia and Africa, Pulitzer Prize-winning journalists Nicholas Kristof and Sheryl WuDunn's new book Half the Sky chronicles the stories of women who have escaped from slavery, narrowly evaded death in childbirth, and hoisted themselves out of the depths of poverty. Among the women they profile is Angeline Murimirwa (née Mugwendere), one of the first students to be supported by Camfed. Growing up in Zimbabwe, Angeline was so determined to attend primary school that she persuaded her teachers to let her wash their dishes in exchange for school supplies. A brilliant student, she graduated at the top of her sixth-grade class-but her parents didn't have the resources to send her to secondary school. When Angeline's path crossed with Ann Cotton's, the founder of Camfed, she had the opportunity to return to school. Today, Angeline is the Executive Director of Camfed's Zimbabwe program and an inspiration to her community and country. Read an excerpt of Angeline's story here. Half the Sky concludes with a call to action to end injustices against girls and women worldwide through a massive grassroots campaign for education and empowerment. We were thrilled to see that the first thing Nick Kristoff and Sheryl WuDunn call for is a $10 billion investment over five years to educate girls and reduce the gender gap in education. Half the Sky is an inspiring and compelling collection of stories, but it is more than that. It is a passionate reminder that giving women the resources to fight their oppression and bolstering their potential to succeed will not only benefit their families and communities-it will sow the seeds for a healthier, more peaceful, and more just and prosperous world. "The feedback we are getting says what inspires young people is the chance to do hands-on experiments and tackle real-world problems. Health and safety regulations have limited schools' ability to do this. We need to maintain an excitement in science and show it's not about learning dull facts." Molotov cocktails for GCSE! You know it makes sense. I'm reminded, for some reason, of my favourite scene in Tarantula, Clint Eastwood's first film. Man looks with dismay at sinister-looking test tube: It looks like an isotope. Scientist: It is. A radioactive isotope. You can read an interview of Ryan North (of Dinosaur Comics fame) by Joey Comeau on A Softer World. Things are still a bit tricky. I write posts and put them in the drafts folder. I told someone the other day that I would try to write a review and not put it in the drafts folder, but I have failed; there were larger implications. It's very bad. 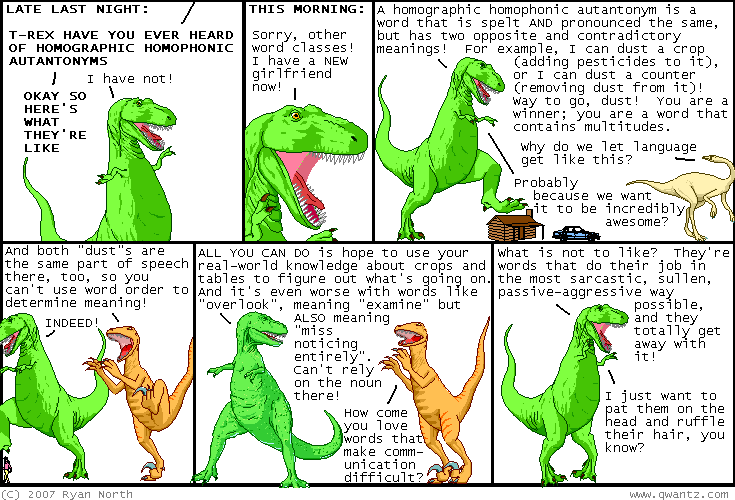 Still, I'm definitely catching up on Dinosaur Comics of yesteryear. If I'm not careful I will end up just embedding the entire Dinosaur Comics oeuvre, which is not really a solution for Drafts Folder Syndrome, but anyway, Pi Approximation Day, wish I'd thought of that. I'd just like to take this opportunity to thank all the readers who bought secondhand copies of The Last Samurai and sent a token of their esteem to the author via PayPal. I'd especially like to thank the reader who generously sent $150, thereby enabling me to buy a decadent sofa on eBay (you know who you are) and the five readers who sent donations of $50, enabling me to splash out on Michael Crawley's The R Book, Deepayan Sarkar's Multivariate Plots in Lattice and other indispensable works of reference. But I'd also like to thank the hundreds of readers who took the time to send a donation of a dollar or so, when it would be easy to think the amount was so small it would make no difference. It does make a difference. In this case, the difference between buying BonaVista's MicroCharts and prudently deferring in the interest of more or less manageable credit card debt. I seem to have fallen into a humorous tone which does not really express my feelings. I'm always touched when a reader takes the trouble to do this. You didn't have to do it. It's completely optional. You're absolutely entitled to buy a secondhand book; it's not obligatory to send something to the author, it's just an unbelievably nice thing to do. So thank you all very much. Things are a bit tricky at the moment. Andrew Hussie's guest post on Dinosaur Comics captures the mood.